In the book of Isaiah, the beginning of chapter 6 contains a startling vision the prophet records of the heavenly place. 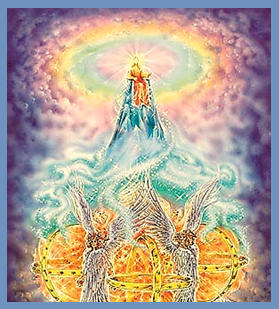 The vision contains the widely-recognized imagery of the Holy One in the Temple, and of the angelic beings who cry out “Holy! Holy! Holy!” This particular vision is one among many descriptions in the Scriptures of a heavenly event classified by Biblical scholars as a “divine council,” as can be found elsewhere in such passages as Psalm 82; 1st Kings 22:19-23 and 2nd Chronicles 18:18-22; Job 1:6-12 and 2:1-7; Daniel 7:9-10 and 13-14; Zechariah 3:1-10; Psalm 89:5-8, among others. These scenarios are records of what the ancient Hebrews saw in visions about the abode of the Most High outside of this earthly realm. The event recorded for us in Isaiah 6 is noteworthy among all the visions of heaven up to this point in Scripture because it is not just a prophet telling of what was seen at the divine council in heaven, but shows the prophet himself actually interacting with the scene and situation. Before this point in such revelations of the supernatural realm, the prophet merely viewed the heavenly scene, but was not a participant. The involvement of the prophet here brings up a detail that should be startling to all who read the account. This study will endeavor to bring out this nuance and why it is significant. This passage records the first time a human being was allowed to participate in a divine council meeting. The first point that needs to be grasped in this matter is the context of the setting. In this vision of the spiritual realm, the Holy One is shown as the Priest in the heavenly Temple. This has not happened before in any previous divine council vision. Others were always more of a court-council setting, not in a Temple. This vision shows us the heavenly Temple, which is significant. The description of the Most High is also quite telling at this point. It mentions the grandeur of His clothing. Most translations render the Hebrew word used here – SHULAV - as “train,” but it is found previously only in the description of the priestly attire as describing the “hem” of the priest’s robe upon where the golden bells and pomegranates were placed. The imagery, then, is that the Creator is acting as a priest, and not just possessing a kingly “train.” This is validated for us further by the fact that the prophet also tells us the location of this vision is the heavenly Temple. It is also here called a “House,” a term used in Scripture to describe the holy grounds. The inclusion of an altar in this place also signals that what are described are the intimate workings of the heavenly place of worship! Isaiah was therefore witnessing a Temple scene in the heavenly realm, and gives the enlightening detail that the Holy One is here acting as a priest in the heavens! It is in comprehending this fact that the gravity of the situation becomes very apparent; the prophet’s terrified reaction is absolutely understandable. He declares that he is going to be destroyed. Think about that. Consider the reality that on earth, at the Temple site in Jerusalem, the people who participated in worship and sacrifice there could only go in as far as the court that held the altar of sacrifice and the lavers for washing. Beyond that laid the Holy Place, that which was off-limits to everyone in Israel except for the priests themselves, who entered into the veil of the House and attended to the showbread, lit the seven-branched candlestick, and offered incense upon the altar inside. Even a prophet in all his intimate spiritual calling was not able to go into the Holy Place of the Temple. Beyond the Holy Place was the Holy of Holies, in which only the High Priest alone could enter, and then only one day out of the whole year. What we find here is that Isaiah has been transported in a vision not to an earthly Temple, but to the Temple in heaven. Neither is it just any part of the heavenly Temple, but rather, he has been brought into the Holy Place itself! The details provided in the vision prove this to be so: the altar has burning coal upon it, which could legitimately be either the altar of sacrifice outside the Holy Place, or the altar of incense inside the Holy Place. However, the text speaks of tongs being used to lift a burning coal off the altar. Whenever Scripture speaks of tongs being used in the Temple, it is only ever in conjunction with the articles that are inside the Holy Place – never outside of it (see Exodus 25:38, 37:23; Numbers 4:9; 1st Kings 7:49; 2nd Chronicles 4:21). That particular detail zeroes-in on the location of the vision as being in the heavenly Holy Place. All of this is important for understanding the reaction the prophet Isaiah exhibited when he realized where he was at; on earth he could not legally be present in the Holy Place, for it never declared that he was a Levite (his tribal lineage is not explicitly stated in Scripture, but according to Jewish historical tradition, relayed in the Talmud, tractate Sotah 10b, he was of the tribe of Judah as a descendant of Judah and Tamar). If he was not allowed in the Holy Place of the earthly Temple, how much more so was he out of place in the heavenly! His reaction is thus entirely justified: he is going to die! No matter his prophetic calling or sincerity of faith – he was yet not where he should otherwise be. This self-sentencing Isaiah proclaimed is based also on the admission that he is a man of unclean lips, and is in a place of absolute purity. Furthermore, he compounds the need of his death-sentence by adding that he also dwells in the middle of a people of unclean lips. His own sin and the sin of his people merited his destruction, according to his own perspective. Isaiah is in a place no human should rightly be able to stand, and his realization of his locale prompts this self-condemnation. He must die because the Holy One is holy through and through, and he is unclean from inside-out. Salvation comes for Isaiah from an unusual place. 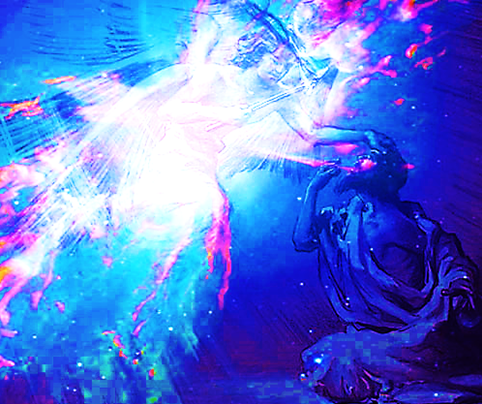 The prophet’s life is spared by the curious action of a Seraf – one of the Serafim – the winged angelic beings there in the Presence of the Most High. The Seraf takes a burning coal from the altar of incense and touches it to the lips of the prophet. The act of taking the burning coal is itself a very odd detail. Firstly, it very likely was an action that made Isaiah feel like his utterance of coming destruction was valid, for the coal came forth off of the altar of incense, as we have seen it would have had to so come, and it was king Uzziah’s sin with that very altar’s earthly counterpart that brought about his own unclean destruction from leprosy (see 2nd Chronicles 26:16-23) – a destruction that Isaiah records for us had just recently taken place (see Isaiah 6:1 above). The context surrounding the mortal smiting with uncleanness of the king was that he entered into a place he had no business being in, and had engaged in an act he had no right to perform – and now a coal from the same type of altar (but the one in heaven) was being brought to the self-ascribed uncleans lips of Isaiah – thus it would seem like his declaration of his doom was coming to pass immediately. King Uzziah’s sin was being in a place he did not belong, and taking part in a priestly action regarding the incense altar he had no right to perform, and now we see the prophet, who was very much aware of how the former king had met his demise, being found in the heavenly counterpart of the Temple, and presented with a situation where a coal from that same type of altar is about to meet his unclean lips. The context of the death of the king sets the absolute seriousness of the vision Isaiah was participating in. But that doom did not come. Instead, he is saved by this odd action. The angelic being picks up the burning coal from the heavenly altar of incense with a heavenly tool – a pair of tongs. Why should this be odd? The reason is that the Hebrew word SERAF literally means “Flame Being.” Is that not intriguing? The Serafim, who shout out the realization of “Holy, Holy, Holy,” are angelic beings who somehow exist while engulfed in or consisting of flames! These heavenly inhabitants are truly on fire for the Most High. So why does the Seraf use a pair of tongs to pick up the burning coal? Wasn’t that unnecessary? The being is already on fire! 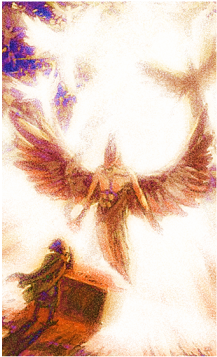 That detail is admittedly bizarre, when you think about the nature of the angelic being. An entity of which fire is an integral aspect of its very nature could not (or was not allowed) to touch a burning coal from the altar. The Seraf, even though it was burning at every moment and yet not consumed, had to use a pair of tongs to pick up the burning coal, because it was the Holy One who first set the coal upon the altar, for that was the prescribed duty of the high priest to burn the incense, which necessitates that the coals also had to be set by the high priest (see Exodus 30:7-8), or else the incense could technically be viewed as being burned by whomever lit the fuel in the first place. It had to be the high priest, as the verse referenced above states it was Aharon’s duty to do (he being the high priest). Since the coal had been touched by the Holy One, who was Himself seen earlier in this vision as wearing a priestly garment, it thereby carried a holiness far greater than the created nature of the Seraf. The burning coal could only be safely picked up by an inanimate object, and not by the burning hands of the Seraf. It thus had nothing to do with the burning aspect of the coal being any hotter than the burning Seraf, but of the surpassing holiness of the Most High who had placed it there. ​This rather humorous assertion yet displays a spiritual truth that signals well the desire of the Most High to meet the needs of mankind that he cannot himself realize. It is far more than a physical need that man must have addressed; it is a spiritual necessity for man to be cleansed of his sin so that he can be in the Presence of the Holy One without fear of destruction. A way has thus been provided. The Most High has put into place a path back to Him. That path is seen beautifully in the vision Isaiah was given of the Holy Place in the Temple. The heavenly tongs bypass the isolated holiness of the Father so that the means for man to attain salvation from his perversity can be attained. The tongs in the hands of the Seraf are able to lift a burning coal from the altar and touch the prophet’s lips, removing his wickedness and atoning for his sin! What kind of coal is this? The Hebrew word used here is RITZPAH, and literally means a “burning coal,” but it is truly so much more than simply a heavenly firebrand! It is a powerful symbol for the Messiah Himself – Yeshua, the Son of the Most High! The burning coal that comes from the altar that is touched to the lips of Isaiah has the ability to atone for his sins. This is no mere heavenly coal, but is a symbolic presentation of the Messiah Yeshua. He is the vessel provided by the Father to bring about the removal of man’s sin. A mere burning ember from heaven does not have that authority to forgive – but the Son from heaven most surely does (see Matthew 9:6; Mark 2:10; Luke 5:24)! Remember well that the coal was set ablaze by the high priest – that is a key part of the duty of the high priest. In doing so, the coal is imbued with a holiness that comes from the high priest, and in that same way, it would have been the Father in heaven who set and lit this particular coal upon the altar in heaven (only one burning coal is ever referenced there, interestingly – no other coal is spoken of as even being on the altar), so that it thereafter possessed a level of holiness surpassing anything else described in the scene, to such a degree that even a Seraf – a burning angel – could not physically touch the burning coal! This is a clear reference to the Son of the Most High; the Man given the full authority to forgive sins from the Father and possess a holiness rivaled by no other person! It is also worthy to point out that the Hebrew term used here for “burning coal,” being the word RITZPAH, appears spelled and pronounced this exact same way only six other times in the Word, and in each of those instances the translation can only legitimately be along the lines of a “pavement,” a laid stone floor (see Ezekiel 40:17-18; Ezekiel 42:3; 2nd Chronicles 7:3). Astonishingly, every one of those appearances has the context of referring to the paved grounds of the Temple complex! 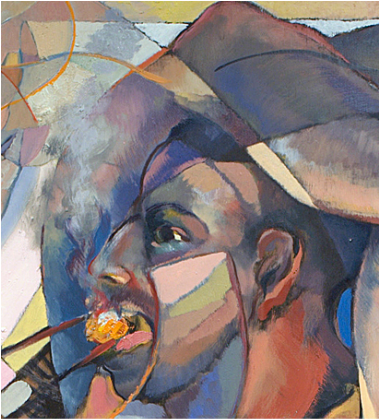 This detail shows us that the portrait of the Messiah as the RITZPAH “burning coal” encompasses the scope of the lowliest of things as an object to be walked upon to an object in the Holy Place in heaven imbued with holiness straight from the Presence of the Most High, with the authority to remove a man’s sins! Yeshua is spoken of in Scripture as being of little thought to others at times (while yet being the foundation of all true worship), to being exalted to the Image of the invisible Creator! Therefore, the usage of RITZPAH to reference both the “pavement” of the Temple grounds and the heavenly “burning coal” that takes away the unclean sins of Isaiah is a perfect reference to the Messiah of Israel! This is how the text was translated into the Aramaic language for all the Aramaic-speaking Jews who returned to Israel after the Babylonian captivity. 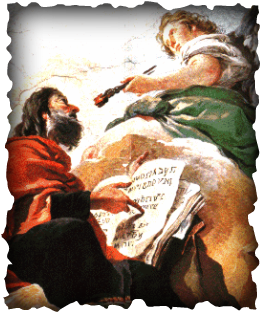 The Serafin (Aramaic pronunciation for “Serafim”) brought forth a “burning coal” to Isaiah. The choice of word for “burning coal” in the Aramaic is significant. It is GEMURTA, and while it has a use of “burning coal” in that language, the root concept is something much different: a perfect thing! When the actual concept behind a “burning coal” is understood and applied to the events related in Isaiah chapter 6, it illuminates for us the nature of what was used to remove the sins of the prophet: a thing of perfection was needed to atone for his sin! The Aramaic GEMURTA here in this translation is a wonderful depiction of the nature of Yeshua and why He has the right to remove our wickedness – He is flawless, free from all imperfection! 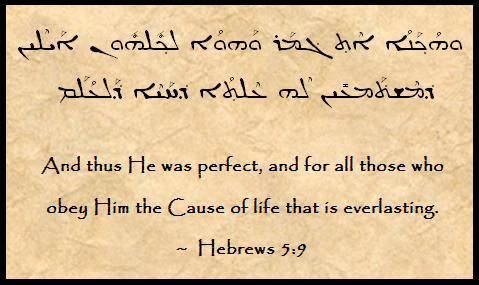 Messiah’s perfection burns away our imperfection, and imparts to us His own perfect nature! The term is here inflected for grammatical necessity and pronounced as ETHG’MAR, meaning “perfect / mature.” The same Aramaic term found in Isaiah 6:6 for “burning coal” is here used in its other sense of “perfect.” The hint to His symbolic presentation of “burning coal” is actually found here even by the context of the passage in an amazing manner, for the Aramaic term used in the text that I have translated as “Cause” is ELTHA, which is also spelled exactly the same way as the Aramaic word ALATHA, meaning “sacrifice / altar / burnt offering,” as it comes from the Hebrew cognate term OLAH, meaning “burnt offering.” This is an amazing wordplay in the Aramaic that is known as a Janus Parallel or a pivot, which the interested reader can find out much more about in my study PRESERVED WITH PIVOTS, available at that link. 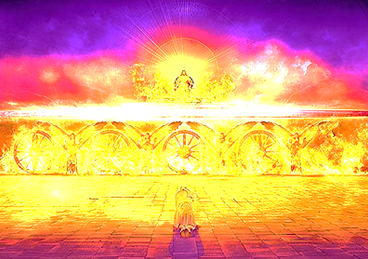 The wordplay is important to us in this context if the term is understood particularly in its “sacrifice / altar / burnt offering” concept, for it shows us a hint to Messiah being connected integrally to the altar itself, and is here spoken of as being “perfect,” just as we see Him being the “burning coal” / “perfect thing” on the altar of incense in the Hebrew text of Isaiah chapter 6! It is astonishing how the Spirit wove His message of redemption throughout the books in repeated symbols and meaning and interlocking the reality of His way to salvation through different words and shared definitions. Our Master is amazing! This Aramaic term ELTHA also has a third meaning that further proves how intricately-laced is the purposed intent of salvation through Messiah throughout the Word. While it most definitely can mean “cause” and “sacrifice / altar / burnt offering,” the term is also used when speaking of the “subject” of a book. Why is this significant to the discussion in regards to the importance of the “burning coal” seen in Isaiah 6:6? The worth of bringing up this particular meaning of the term is found when one refers to yet another ancient Aramaic translation of the book of Isaiah – the Targum Yonatan. In that translation, which chose to be somewhat more free and dynamic in how it rendered the Hebrew text it was translating, a very notable difference lay in what the Seraf brought to Isaiah to remove his sins. Instead of a burning coal from the altar, the Seraf rather brings forth a “word” and puts it in the prophet’s mouth! The reader will likely immediately consider how the Messiah Yeshua is referenced in the book of John 1:1 to be “the Word” that is from the Father! 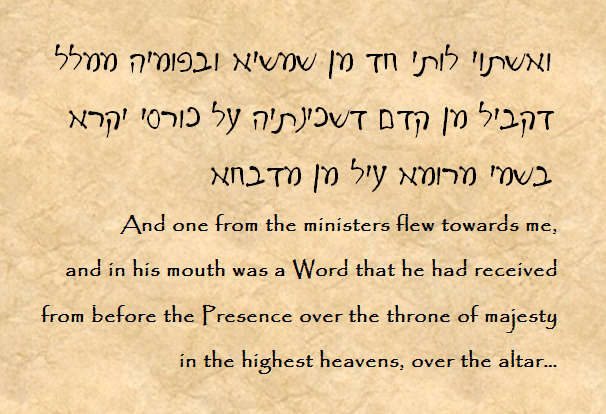 ​This passage as a whole is very interesting, but here we see that the High Priest Y’hoshua (Joshua in the English Bible versions) is seen in a vision in heaven by the prophet Zechariah, and the Accuser (SATAN in the Hebrew text here) is standing against him. The Most High tells us that Y’hoshua is an “ember” taken from the fire. This symbol is important, because it equates such a coal to the High Priest. Furthermore, this High Priest’s name is none other than Y’hoshua / Joshua! The significance of this detail cannot be missed: the Messiah’s name is Yeshua, which is merely a variant form of the name Y’hoshua (see Ezra 3:2 & 8; 5:2; 10:18, where this very same man is spoken of and his name is rendered repeatedly as Yeshua, as well as Nehemiah 8:17 where Y’hoshua Ben Nun is there called Yeshua Ben Nun)! In the Hebrew Scriptures, this man essentially has the same name as the Messiah! ​With this understanding in place about the interchangeability of the name Y'hoshua / Yeshua, when the Father shows Zechariah the prophet the person of Y’hoshua the High Priest in the vision, and says he is an “ember” taken from the fire, we must surely grasp the connection of symbols back to the “burning coal / perfect thing” depicted in Isaiah 6:6, which was able to make atonement for an unclean prophet! That symbol was clearly shown to be pointing to Yeshua the Messiah, who has the authority to remove the sins of mankind! The imagery is consistent and amazing: a burning coal = the Temple foundation pavement = a perfect thing = the Word = Yeshua the High Priest! It is this consistent flow of imagery that points to Yeshua as the Messiah and able to remove sins that brings us to the astonishing reality of the consequences of the events of the divine council Temple vision in Isaiah chapter 6. Isaiah was a prophet who stood in a place he had no legal right to be in: the heavenly Temple. He was unclean and full of sin, and the only remedy for his nature was to be given atonement. That atonement came through the burning coal on the altar – a thing made holy by direct contact with the High Priest who is the Creator, and whose touch removed the prophet’s sin. It is the function of the high priest to atone for the sins of the people. Nobody else could operate in such a role. The fact that the burning coal was able to remove the sin of the prophet thus necessitates that it was acting in the role of the high priest, as well, for it was given the authority of the Most High High Priest – the Creator! This is exactly the role Messiah has inherited in His position of an eternal priest of the order of Melchizedek (see Psalm 110:1-4 that discusses His divine ordination in that order, and Hebrews chapter 7 which discusses Messiah’s priestly function therein). This heavenly priesthood is above and beyond that of the earthly Levitical; operating in such a way that the Levitical is only a shadow of the role played in heaven by the priesthood of Melchizedek. The atonement received by Isaiah from the burning coal (Yeshua the Messiah as a High Priest) is of such thoroughness that a prophet who could not legally stand in the earthly Holy Place of the Temple is thereafter allowed complete sanction to stand in the very Holy Place of the Temple in heaven itself! That is a glimpse of the sheer power of the redemption mankind experiences when the Messiah burns away the sin that is otherwise embedded in our nature! When a fallen man knows redemption by the Holy One’s Messiah, he is raised not merely to life, but to the priesthood of heaven, a participant in the affairs of the Spirit, and given a commission to call other fallen people to the abundant life available only by coming to Yeshua and receiving forgiveness for their faults. Let the reader notice how I have rendered the Hebrew of this verse regarding the word most commonly translated as “send.” It is an inflection of the Hebrew term SHALAKH, and from it comes the concept of the SHALIAKH, literally meaning a “sent one,” or a “delegate,” which is what the Greek translators popularly translated into the word English speakers have come to know as an “apostle.” The Holy One asked who would be the apostle for the heavenly Temple. Isaiah, the prophet who had just experienced atonement from his sins by a heavenly Source, was emboldened by this spiritual cleansing to nominate himself to be an apostle for heaven! His volunteering is accepted, and the rest of the chapter goes into the very serious details of what his apostleship would entail. It would not be easy, but it would be necessary. The authority from heaven given to Isaiah that came through his atonement by the burning coal is the same that anyone who comes to Yeshua can hope to receive. When sins are atoned for, minds are renewed filled with His Word, and man is empowered to do the work of heaven once more; we can be the image of the Most High on the earth, reclaiming souls for the coming Kingdom. The events of Isaiah chapter 6 are an incredibly serious and hope-filled depiction of what it takes to correct the wrong of man, and what happens when we are made clean once more. When the burning Coal of heaven touches unclean lips, priesthood is restored, and souls are redeemed.